Is it possible to have a planet orbit two stars, like Tatooine? It is possible, and we’ve actually found a number of planets orbiting double stars, like Luke’s homeworld in Star Wars does. However, outside of the Star Wars Universe, there are a lot of ways for this setup to go very wrong. 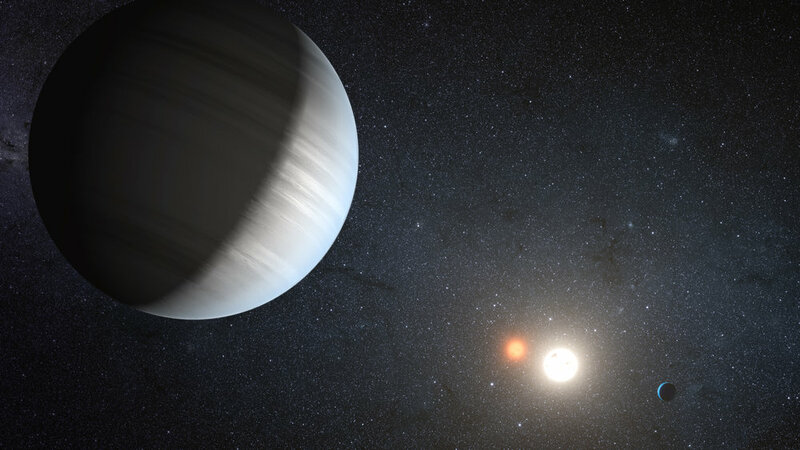 So far, we haven’t found an enormous number of planets orbiting double stars, which seems to speak to how rare it is for a planet to survive in an environment like Tatooine’s. At the beginning of Star Wars, Luke Skywalker lives on a planet with a double sunrise, on a planet which orbits two stars. 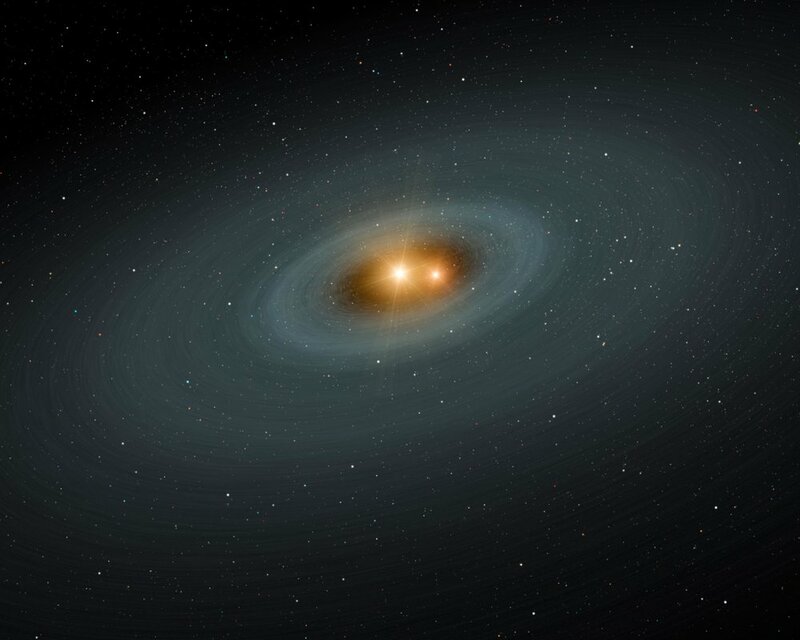 We can presume that the two stars are orbiting each other, and that this planet then orbits around both stars. The technical term for two stars which orbit each other is a binary system, and the easiest way for the stars to find themselves in this situation is if they both form out of the same cloud of gas, at the same time. The remainders of that cloud of gas would hang around long enough to make planets to surround the pair of stars. If a planet were orbiting far enough away from the two stars, it wouldn’t really notice a difference between orbiting the double star set, and orbiting one star of their combined mass. However, by the time you get really far away from the stars, there’s not a tremendous amount of sunlight reaching the surface of your planet. If you want your world to be habitable (and a desert world still counts), you’ll have to be on a planet that’s a little closer to the stars, and this is where things start to get tricky. If you are a planet, it’s nicest if the two stars orbit each other closely and circularly. This kind of setup for the stars means that you’re more or less always the same distance from the stars, which guarantees you a pretty consistent amount of light from the stars. If you’re trying to be a habitable world, this is important, because it keeps your surface temperature roughly consistent as well. You’d still have some variability, because the stars will still eclipse or partially eclipse each other periodically, which would lower the amount of light you’d get on the surface. However, if you are a star, close orbits are more complicated than wide ones. Wide orbits are easier to maintain, because the two stars have a weaker gravitational influence on each other. In a smaller orbit, the two stars will exert a reasonably strong tidal force on each other, and will change each other’s orbits over time. When the orbits of the stars begin to change around, the planets’ orbits also change, and you are in prime conditions for what’s called a three-body interaction. The three body interaction happens when you have three objects orbiting each other in relatively close range. This could be three stars or two stars and a planet, and in either case, the lowest mass object can wind up getting flung suddenly out of the solar system entirely. The other outcome is for the planet to wind up crashing into one of the two stars - not a habitable outcome there, either. 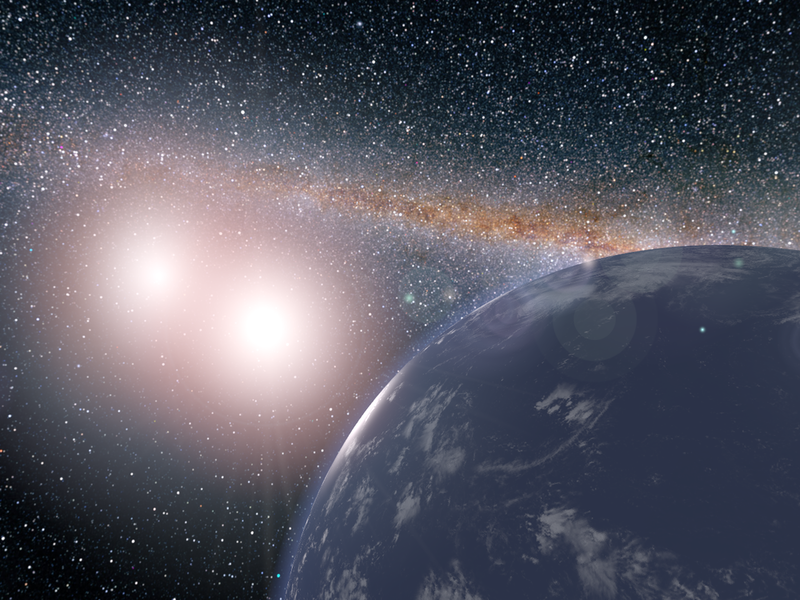 The three-body interaction is of particular concern for two stars and a planet, as this means that if your planet is close enough to the star to get caught up in one of these interactions, it won’t stay as a planet in the solar system for a particularly long time. This might partially explain the relatively low number of circumbinary planets we’ve seen so far with Kepler - these planets are prone to either being ejected or consumed by their parent stars. So it’s not impossible for a Tatooine-like planet to orbit a binary system, but given how rare they are in our solar system, everything has to be exactly so, or Tatooine will wind up on a one-way trip out of its solar system on a journey through its home galaxy. Want to see this post a day early? Become a patron on Patreon! How long would it take to deflate the Earth's atmosphere out into space? If any of you haven’t seen the previous Portal 2 post, I’d recommend having a look at it here, because I’m going to pull some numbers from it. I’m also going to make some slightly unphysical assumptions, but the results of those assumptions is that we’re going to calculate a lower limit to the amount of time it would take to bleed the atmosphere dry. In a world where portals actually worked, it would almost definitely take longer, for reasons we’ll go over later. Our scenario is thus: we have opened a portal between the surface of the Earth and the Moon, as in the end of Portal 2. Effectively, we’re opening a window between the surface of the Earth and a pretty hard vacuum. The dramatic pressure difference here produces a tremendous, faster than the speed of sound, wind, as we worked out in that previous post. Presumably, if you left that portal open for a long time, you would reduce the amount of atmosphere left on the Earth. In the game, this portal is only open for about 30 seconds, but what if we left it permanently open? The first thing I’m going to assume is that the whole atmosphere of the Earth is entirely at the same pressure (which it is not). Down at the surface where we humans live, the atmosphere is pretty compressed, and so we have an ambient atmospheric pressure of 1 atmosphere. (Yep. That’s the unit.) 1 atmosphere is equivalent to about 14.7 pounds per square inch, or psi. However, the further up away from the surface you go, the more diffuse the atmosphere gets, and both the density of atoms and the atmospheric pressure drops. If the density of the atmosphere drops, the wind speed through our window will also drop, because it’s the difference in pressure on the two sides of our window that drives the wind speed. By assuming that I can compress down the upper layers of the atmosphere so that the air on Earth is at a constant 14.7 psi, then the wind speed will stay at its fastest, and bleed the atmosphere out into Moon space as fast as possible. If you compress the atmosphere down, it would fit in a sphere 1999 km across, which then has a volume of 4.19 x 10^18 cubic meters. This...is a big number. How fast can we drop it to zero? I will have a reasonable guess that the portal itself is about five feet tall by three feet wide - it seems a bit shorter than Chell in game, and wide enough for her to fit through. If we assume that it’s rectangular instead of an oval, the math is nicer, so I’m going to square up the portal dimensions at about 1.5 meters high by 1 meter wide. This gives a portal area of 1.5 square meters. This is key, because with the area of the window, and the wind speed, we can figure out the volume of air lost every second. At 411 meters per second, our speed from the older post, that means that after one second, a bit of air will have traveled 411 meters. Every second, we’re going to lose about 617 cubic meters of high pressure Earth atmosphere into the space surrounding the Moon. We know how much we have to lose, so from here we can sort out how many seconds it would take to get the total volume of the Earth’s atmosphere out through our portal. As you can probably guess by the 18 zeros following the total volume of the Earth’s atmosphere, it’s going to be a lot of seconds. In fact, it’s so many seconds that seconds are not a useful unit even a little bit. Converting into years is a little better. It would take 215 million years. And remember, this is assuming that the wind speed stays the same the whole time, which it would not in real life. The other thing we’re assuming is that none of this gas will hang around the moon and increase the atmospheric pressure around the Moon. That would also start to balance out the pressure difference, slowing the wind speed down and making this take even longer. The moon historically is not very good at holding onto an atmosphere, so this would likely be a temporary arrangement, but millions of years is not very long for astronomical things, and it’s possible the lunar atmosphere could hang around long enough to slow down our wind. The estimates for the atmosphere around the young moon is that it would have stuck around for 70 million years or so - shorter than our fueling time, but long enough that we could expect it to hang around for a while, before we’re able to finish emptying the Earth’s atmosphere into outer space. In reality, there would likely be an equilibrium point reached, where both the Moon’s newfound atmosphere and the Earth’s freshly drained atmosphere would find themselves at the same pressure, and the wind, having gradually slowed, would come to a stop, with only the vaguest breeze from the Earthward side as the Sun gradually stripped the atmosphere from around the Moon. Your friendly neighborhood astrophysicist recently wrote an opinion piece for Physics World, on how I approach writing answers to your many questions. Read the full article here on Physics world - I hope you enjoy! While you're over there, check out the review of Astroquizzical: A curious journey through our cosmic family tree! If black holes are so bad at growing, how do we get supermassive black holes? This is such a good question that the answer is not particularly settled yet - we have some ideas for how some supermassive black holes may have gotten so large, but it’s not clear that the explanations we’ve come up with so far hold true for all supermassive black holes. So a few definitions before we launch into our ideas - by and large, all massive galaxies have a gigantic black hole at their centers. To distinguish these central black holes from the type of black hole created when a single, massive star ends its life, we named the big ones “supermassive”. The black holes created from single stars are less entertainingly named “stellar-mass black holes”. Black holes of all sizes are extremely inefficient at gathering new material to themselves. Rather than absorbing nearby material in one fell swoop, the material is more often than not pulled into a tight disk of extremely hot material, or flung away from the black hole entirely, sometimes at relativistic speeds. For all black holes have a reputation of being cosmic garbage disposals, if you had a garbage disposal this terrible in your own kitchen, after the first time it blasted superheated onion bits on your ceiling you’d call a professional to have it removed ASAP. So it is an eminently reasonable question - how do you make a black hole that’s thousands of times larger than the ones that are made by stars, when they’re exceptionally bad at growth? This question is made more complicated because right now, getting a star to explode in a supernova, and the remnant collapsing down into a black hole is the most robust theoretical model we have to make a black hole, so you have to somehow bridge the gap between something that contains a few times the mass of the Sun and something that contains thousands of times the mass of the Sun, while that thing steadfastly refuses to grow rapidly by accreting new material onto itself. What can we do? Well, we can either 1) start larger, or 2) grow differently. If you start larger, then you have the benefit of not having to grow by a factor of several thousand but only by a couple. This method means you have to start with “seed black holes” very early in the universe. You can do this in one of two ways. First is the direct collapse model - the thinking goes that it might have been possible, very early in the universe for enough gas to collect together that its gravity would just collapse all the way down to a black hole, skipping the star phase entirely. The second method is effectively to go through a star first, but to go through a very, very large star - something much larger than the Universe makes nowadays, which would burn through its hydrogen much faster, and would make a larger black hole as a remnant. What about growing differently? It’s possible that instead of growing by slurping tiny fractions of gas and dust from its surroundings, the black holes grow by absorbing other black holes. This raises a whole string of other questions, like “are there even enough black holes around for that to work?”. We know that there should be times when galaxies gain a second supermassive black hole - during galaxy collisions. The remnant of the two galaxies should have two black holes which sink together, immediately doubling their mass. But it’s unclear if you can guarantee that enough galaxies will smash together enough times for this to work for all the galaxies we see, especially since not all galaxies are expected to merge with another galaxy the same number of times. There’s no reason the answer will wind up being one or the other - some combination is likely to be in play. If you can start with a larger seed in the early Universe, you can grow more easily through a combination of colliding with the supermassive black holes in other galaxies, and by gathering gas inefficiently to themselves.